-Incredible cinematic effects and stop motion animation sequences! 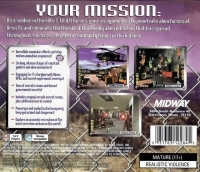 -Six long, intense stages of constant gunfire and alien encounters! -Engaging Sci-Fi storyline with Aliens, UFOs, and secret experiment coverups! -Tons of secrets rooms and buried government secrets! -Includes original arcade secret rooms, plus additional secret rooms! -Powerups and sophisticated weaponry keep you armed and dangerous! -Explore an accurate recreation of the most secretive airbase in the world! 07-21-2017 shepard11 Box Text YOUR MISSION: As a soldier in the elite S.T.A.A.R Forces, your assignment is to penetrate alien forces at Area 51, and eliminate the threat of the deadly alien infection that has spread throughout the base. The fate of humanity hangs in the balance. -Incredible cinematic effects and stop motion animation sequences! 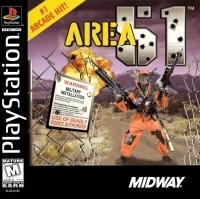 -Six long, intense stages of constant gunfire and alien encounters! -Engaging Sci-Fi storyline with Aliens, UFOs, and secret experiment coverups! -Tons of secrets rooms and buried government secrets! -Includes original arcade secret rooms, plus additional secret rooms! -Powerups and sophisticated weaponry keep you armed and dangerous! -Explore an accurate recreation of the most secretive airbase in the world! This is a list of VGCollect users who have Area 51 in their Collection. This is a list of VGCollect users who have Area 51 in their Sell List. This is a list of VGCollect users who have Area 51 in their Wish List.